Example: You may enjoy petting your dog, but your dog may not actually care too much for it. Is petting your dog going to be a strong enough reinforcement for him to want to repeat that behavior he was petted for in the future, or would a piece of chicken or cheese, or a toss of his favorite ball be more rewarding for him? I know it sounds silly, but you’d be amazed at the number of people who assume dogs just “come” knowing sit and other behaviors to our language. Remember, dogs do not speak our language naturally, they need to be guided and taught our language and what the meaning is behind each cue. It’s important to be proactive and teach what you’d like from your dog versus correcting and saying “No” to all the incorrect behaviors. Imagine if you went to work at a new job and no one told you or showed you what you needed to do. Instead all your co-workers would do is tell you, “No, you’re doing it wrong”, every time you started to do something. You weren’t given any other feedback. How frustrating! Pretty soon you may not want to even attempt to try anything for fear of being told “No” again. This is what life is like for so many dogs living with people. Example: A dog likes to greet people by jumping up on them (a natural behavior). The owner constantly yells “No” at the dog, he pushes the dog away and may even knee the dog. The dog isn’t given any other feedback, so not knowing any other way and at least receiving some form of attention from his person, he continues to jump in the future despite what his owner does to him. Now imagine that the owner teaches the dog to sit on cue through luring or shaping, gives a cookie or nice verbal praise and pet every time the dog sits, and then ignores the dog completely for jumping. Quickly the dog will learn that sitting yields good results and jumping yields nothing! By changing the feedback and teaching an alternative behavior, the dog and person are both happy in the end. Be sure your dog is healthy. Break behaviors down into small components and teach each step throughly. Keep training sessions fun and upbeat, and incorporate training into your daily activities. Teach alternative behaviors, and what you’d like your dog to do, rather than saying, “No” to everything you don’t want him to do. I frequently get asked these questions when I take my dogs in public, “Are they friendly?”, “Do they bite?” and my favorite “Can I pet them?” My response is always the same, “ Yes, they are friendly,” “No, they won’t bite” and “Thank you for asking to pet them.” My dogs actually enjoy meeting new people, but this isn’t the case with all dogs. This topic of greeting dogs is important because so many of us share our lives with dogs or we know someone who does. With dogs being such popular companions and often times accompanying their people in public, first time greetings between humans and dogs are bound to happen. There are many dogs who are perfectly happy to be pet by a stranger, but there are many others who are uncomfortable with it and may only be tolerating the activity. I urge people, whether you’re a dog person or not, to be respective of a dog’s space and their owners wishes. I hear it time and time again, “All dogs love me…he’ll be fine with me.” This statement often comes after someone has just explained their dog is shy or fearful. By being respectful of the dog and their person, everyone has a more pleasant experience. When I’m first meeting a dog, if the dog’s person is there, I ALWAYS ask if I can pet their dog before approaching. If given the Okay, I will squat down, turn sideways to the dog, and invite him into my space rather than going to the dog and towering over him. By changing my body language and approach I’m helping to communicate to the dog that I’m not a threat and that I come in peace. If the dog chooses to approach me, I then stroke the dog’s chin and under his ears, from there I’ll move my hand to his back– petting in long strokes. Until I know the dog feels comfortable with me, I avoid petting him on top of the head since this is a vulnerable position and many dogs are uncomfortable with being pet on top of their head by strangers. If the dog does not come into my space, I take that as him communicating to me he’s not comfortable with me yet. I respect the dog’s wishes and don’t push the issue further. If an owner tells me their dog is not keen on strangers, I don’t take it personally and thank them for letting me know. Many people take for granted that all dogs are alike, but we must remember that dogs are individuals just like us. Some dogs have a broader range of friends and are more sociable, where others have smaller social circles and are more introverted. We all know of people who can walk into a room full of strangers and make conversation smoothly and comfortably; where other individuals shy away from social situations and assume the wallflower position when placed into them. Our dogs are no different; it’s up to us to know what canine-ality our dog has and to protect them from uncomfortable situations. It’s also important to understand the breed of dog doesn’t represent their character. Again, dogs are individuals and although there may be tendencies within a breed; how social they are with other dogs and people will have a full spectrum of possibilities. Be mindful of what a dog may be thinking and feeling, ask to pet the dog, read to dog’s body language to get the answer before petting, and don’t judge the dog by it’s cover. I hear it daily in my line of work, “Look he’s wagging his tail, that means he’s happy…or he’s fine.” Dogs wag their tails for a variety of reasons, and yes they will wag their tail to show contentment or pleasure, but they also wag their tails when they’re excited, fearful, and about to aggress. Reading a dog’s tail has more to do with their entire body language. Dogs tell you a lot with their eyes, mouth, and general body position. When trying to figure out if a dog is truly happy or content, learning what their whole body is saying is what’s going to be your guide to understanding what they’re feeling. For instance, a dog could be wagging his tail, but if he’s leaning away from you, has his eyes averted and his mouth closed; he is not feeling comfortable. 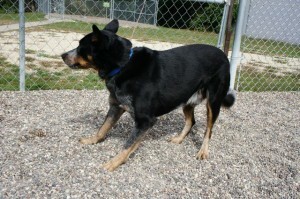 Most likely if his body is displaying these behaviors, his tail may be lowered or tucked, but still wagging. This dog is probably fearful and uneasy. How you move forward with this dog will depend upon whether you are able to read the dog’s body language appropriately. Another scenario you may see is when two dogs are meeting for the first time. Their tails will be wagging, but their tails may be “flagging” in the air. Flagging tails means their tails are above spine level and might display rapid back and forth movements, much like a flag on a flagpole on a windy day. This behavior often means excitement and arousal. Excitement and arousal can tip into aggression if deescalated. 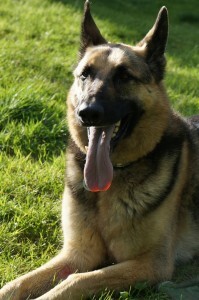 When looking at the dog’s overall body picture, you may notice the dog is putting more weight onto his front end, appearing tall, his hackles (the fur on his shoulder blades and spine) are raised and he may also have a closed mouth, but his eyes are probably direct towards the other dog, not averted. These are all signs of excitement and arousal, and should be diffused by the owner as quickly as possible. The dog will be leaning into whomever is giving him attention or at least standing squarely when meeting another dog. His body will appear to be loose and wiggly. His mouth will likely be open with a smile on his face. His eyes will have a soft look to them. He won’t be staring hard at whomever he is with or completely looking away at all times. His tail will wag in a sweeping motion, back and forth. A dog who is excited will display similar behaviors as listed above, but the tail movement will be more exaggerated. The dog may try to jump towards a person’s face to get closer, or try to lick or smell another dog’s muzzle. Tails are an expression of a dog’s mood and the wag of a dog’s tail can mean many things. So next time you’re with a dog, watch their tail movement through their different behavior changes and daily routines. You will see a difference as their excitement, curiosity, fear, anxiety, and happiness get expressed. And you’ll be on your way to better understanding your dog. *Keep in mind certain breeds of dog’s have tails that carry differently. Example: Basenjis’ tails curl over their back. Other breeds of dogs may have naturally bobbed tails, like some Australian Shepherds, or their tails may be docked, like Doberman Pinschers. 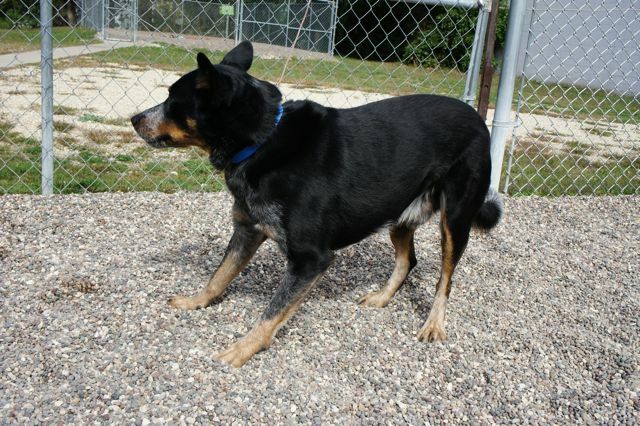 With these dogs, reading their tails can be trickier, but look at the base of the tail and look for changes there. 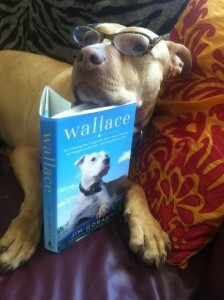 On August 30th, 2012 the book WALLACE was released and stocked on store shelves all around the country. I had pre-ordered my copy in advance and was very excited when it arrived on my door-step the day following it’s release. I curled up and cracked open the smooth, glossy book cover. Within 48 hours, I finished the book and sat back with a smile, and tears in my eyes. Wallace’s story written by Jim Gorant, author of Lost Dogs, which told the tragic and heroic story of the Bad Newz Kennel’s dogs previously owned, abused, and exploited by NFL player Michael Vick. During the writing of Lost Dogs, Jim met the Yori’s, who adopted one of the “Victory” dogs, Hector. Hector was not the first pit bull owned by the Yori’s. Clara and Roo had saved the life of Wallace, a troubled Pitty who’s chances of survival were dim if they hadn’t stepped in, along with the help of a few other dedicated dog people to campaign and fight for Wallace. This story covers Wallace’s life from his first few weeks of life to his time at a shelter—where his life was in limbo—to his rise as a multiple World Champion Disc Dog, once he was given a chance to prove himself and given the proper outlets to do so. I am passionate about Wallace’s story for multiple reasons. As a pit bull advocate and pibble “parent” myself, I understand the unjust negativity toward owning pit bulls and the obstacles we face every day just because our dogs look a certain way. This story also resonates with us Minnesotans since Wallace is a Rochester, MN resisdent and local hero. It’s also a great story about an individual who faces adversity and has the odds stacked against him, given the breed he is and being in a sport that is normally dominated by agile, fast, furry, small Border Collies and Aussies. Wallace also puts a face to many shelter dogs who don’t make it out of the system alive because of their looks or their drive. Wallace is a Pit Bull—even though Pit Bull isn’t a recognized breed, it’s a generic term given to blocky headed, short-coated dogs. Wallace’s story is a perfect example of what many shelter workers and pet owners experience when dealing with these intelligent, loyal, athletic, and sweet dogs. It’s also a great example of the subtle changes that are bringing back the original reputation and image of the Pit Bull as an All-American Heroic icon, a trustworthy canine, and a family member. As an update, Wallace has been suffering from health ailments lately and just last night had to go into emergency surgery. As a result, the Yori family has been hit hard with medical bills; doubly so since one of their other furry family members, Angus, just suffered from a cruciate ligament tear as well. If you’d like to help this family, please consider purchasing the book WALLACE today! I couldn’t put it down, and I’m guessing for those who pick it up, they won’t be able to stop reading it either. A few people have asked how they can help or contribute to Wallace’s care. At this point, we are not in a position to turn people down. On the same day that Wallace had emergency surgery to remove his splenic mass, his best friend Angus tore his cruciate ligament. Now the diagnosis is confirmed that Wallace has hemangiosarcoma, an aggressive cancer. We are researching our options and currently have appointments set up with an oncologist and a holistic vet for Wallace. 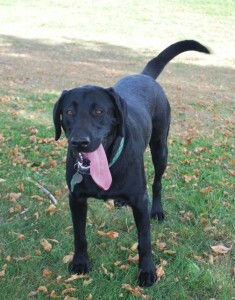 Angus is scheduled for TPLO surgery on Monday 9/17. The outpouring of love and support has been overwhelming. We can’t express our gratitude enough. We can assure everyone that we will make decisions based on his best interest. We want quality AND quantity. Here are some ways that people can help. 2. Buy Wallace’s book. Wallace: The Underdog Who Conquered a Sport, Saved a Marriage, and Championed Pit Bulls– One Flying Disc at a Time Make sure your local bookstores and libraries have it. Read our story. Share it with others. Wallace has made a positive impact on this world and he has more to do. 3. Help a homeless pet. 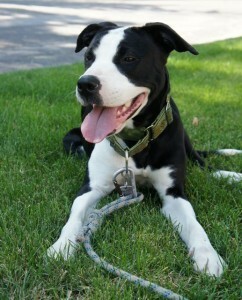 Donate to your favorite shelter or rescue in Wallace’s name, volunteer your time, adopt – Petfinder is a great resource. Then tell us about it. Knowing that something good is being done in tribute to Wallace makes us feel happy. 4. Send stuffies or treats. Wallace loves to destroy stuffed toys, with or without squeakers (they will be destroyed immediately so don’t bother purchasing expensive ones). Treats must be grain-free and poultry-free. Good brands for him are ZiwiPeak, Raw Bistro Stix,Wellness Pure Rewards (venison/salmon), Pure Vita (beef liver/sweet potato). No chews except for Zukes Z-Bones (he hardly has any teeth left). You can send them to him at 4712 19th St SE, Rochester, MN 55904. 5. Continue to send him positivity and love. Say prayers, wish him healing light, reiki, good thoughts… I believe all of that good energy is good for him. 6. I (Clara) am currently doing a painting of Wallace and I will be selling prints online to help with his medical bills. Those should be ready next week if you are interested. 7. Hug your pets and be glad for every moment you have with them. Their lives are too short and they deserve every ounce of goodness possible. This is Wallace on his 10th birthday this year. He knows how to live life to the fullest and we want to help him do that for as long as he wants to. In an effort to be proactive about the 4th of July activities and the blazing heat that Minnesota is currently experiencing, I wrote a Letter to the Editor of the Winona Daily News and also, with the help of my friend Amy Conway, made a PSA poster for keeping pets safe. The letter got published in the newspaper yesterday and is online as well. Here is a link to it; Click Here. The PSA poster was circulated online through facebook and also got published on the ASPCApro‘s blog; Click Here to view it! Remember to keep your pets cool and safe during this time of year. Already in Winona this past week, several dogs have been rushed to vet clinics to receive emergency care due to heat exhuastion. Several dogs also went missing this week after fireworks sent them running in a panic. Be sure to have proper ID on your pets, regardless of whether they are indoor pets or not; when pets panic they will find a way to escape. Also, please do not walk dogs in the middle of the day in this heat. The pavement is boiling hot and their paw pads do burn. Today I witnessed a woman walking her dog on blacktop, the dog was panting heavily and doing the “hot foot dance”. The owner seemed unaware, so I told her politely that her dog’s feet were burning and to get her off the asphalt. It seems like a no-brainer to most of us, but apparently it’s not. So if you witness someone being a complete nitwit and neglecting their pet, please speak up or call the proper authorities. Thank you. To end on a happy note. Here’s Mya, a wonderful medium-sized, mixed breed dog looking for a home. She’s good with children and adults. 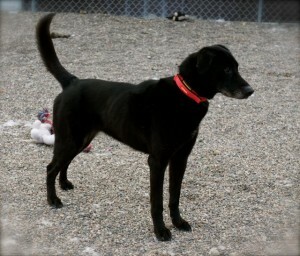 She would do best in a home as an only dog or placed with a male dog equal or greater in size to her. She may do fine with dog-savvy cats. 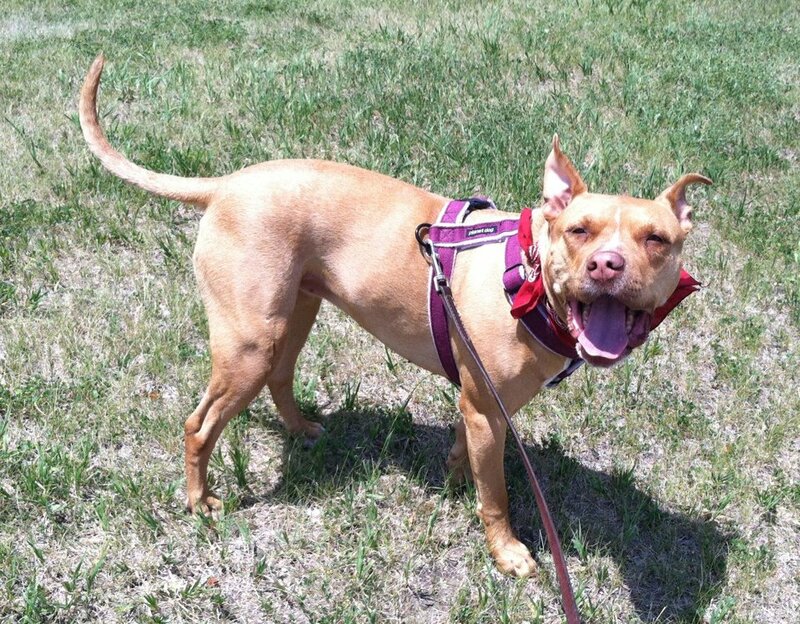 Mya is a goofball and loves to be with her people. She’s done well off leash in low distraction areas. If you’re interested in Mya, please contact the Winona Area Humane Society. Last weekend I attended an official K9 Nose Work Introduction course. I was fortunate to be able to attend both days of the workshop and work each of my dogs, Chance and Emma. K9 Nose Work is a relatively new sport. It was first started in 2006 by three founders: Amy Herot, Ron Gaunt and Jill-Marie O’Brien (whom taught the course I attended). These three individuals wanted to create a fun new way to interact with their dogs and thus began K9 Nose Work. K9 Nose Work (K9NW) taps into your dog’s natural ability and instinct to sniff things out and hunt. All dogs can participate in this activity and they really enjoy it. Dogs are constantly taking in scents and assessing their environment through those smells. K9NW hones in on this ability and turns it into a fun activity for both the dog and their handler. An advantage to doing K9NW over some other activities is that any dog is welcome to participate, even dogs that are shy, fearful or somewhat reactive towards other dogs. In fact, behaviorally challenged dogs that participate in K9NW often times improve with their behaviors because they are given an outlet for their energy, they are mentally and physically challenged by the task, and for shy and/or fearful dogs, it helps build confidence in them. Dogs with disabilities are also welcome to participate. Many dogs doing K9NW are blind and/or deaf, but they can still smell and they figure out their environment based on that. The object of the game is to get your dog to “hunt” down the box that is spiked with their favorite reinforcement, which could be high-valued food or a favorite toy. 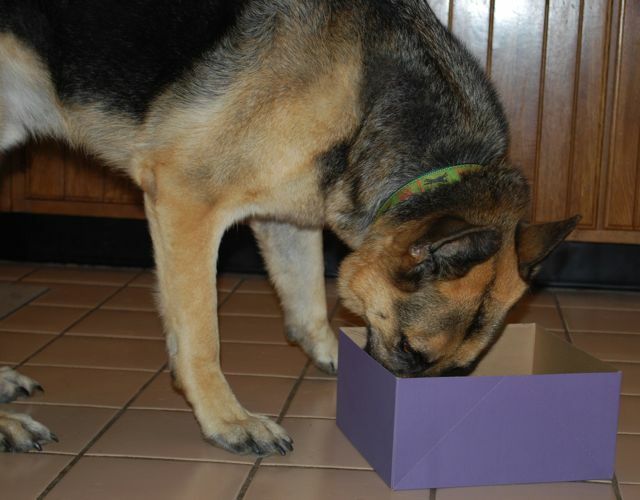 In the beginning, dogs are set up for success, by letting them see what’s in the box and get their reinforcer. Then the box is hidden in sight among other boxes and the dog is let loose to find it. As soon as the dog finds the correct box, they’re rewarded immediately with reinforcers inside the box, and then it’s followed up with additional reinforcers from the handler making it a “jack pot” find. As the dog understands the game and begins to hunt among the boxes, the handler has to be skilled in placing the spiked box amongst the decoy boxes. This can get tricky, so the handler has to become good at “fake outs”! Gradually after many drills in different locations, other containers can be added to the mix to increase the challenge, and eventually the dog can be transitioned into finding specific scents. For teams that are looking to do K9NW competitively, there are K9NW trials and titles. As of now, there are three levels of competition where a team could be titled. Each level introduces a new scent. At the first level, dogs must be able to distinguish and detect Birch scent. At the second level, the scent is Anise, and at the third level, the scent is Clove. At each of these levels the dog needs to find the scent(s) in four different types of settings: container search, interior search, exterior search, and a vehicle search. It takes months of practice to get the point of competing for a trial. Many people don’t do it for the competition though, they just do it for fun! K9NW is a great way to burn off energy in your dog, build confidence in them, and to also build a better bond between a handler and their dog. 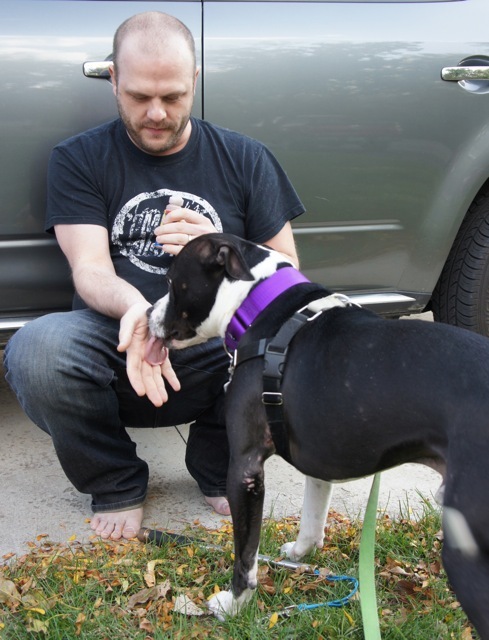 Handlers learn to really read their dog’s body language and ultimately trust their dog. I’ll be putting into practice doing scent work with shelter dogs, since it is a great outlet for boredom and helps create a happier and healthier dog. I’m looking forward to continuing doing scent games with my dogs and building our skills. Who knows if we’ll ever compete, that’s not my goal. My goal is to have fun with them, and ultimately that’s what it’s all about, right! If you’re interested in having some fun with scent detection with your dog(s), let me know. Last week at this time I was enrolled in Chicken Camp 101 with Terry Ryan of Legacy Canine. Terry first started teaching Chicken Camps 15-20 years ago when she wanted to offer dog trainers a way to hone their clicker training skills. Since chickens are often faster than dogs and less forgiving, they were an ideal species for trainers to work with to expand on their skill set and timing. 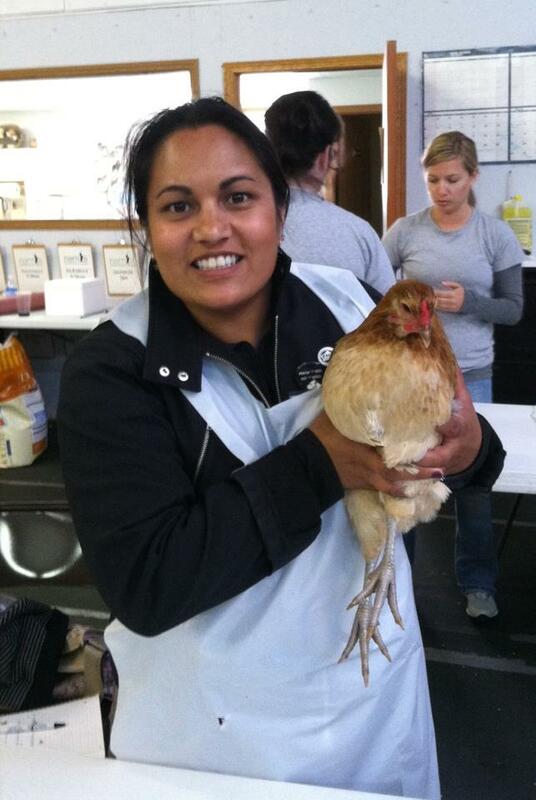 I attended the two-day workshop where I was paired with another person and assigned a chicken. My partner, Patricia Calderone of Clicker Canines, and I worked with a beautiful and talented hen named Chickira. Chickira is a cross between a Wheaten Ameracana and a Welsummer and produces olive-colored eggs (exterior shell). Over the course of two days, we worked on our timing and delivery. Making sure not to be to distracting with our body language when working with the chicken and being sure to click the exact moment the behavior we wanted was being produced. Chickens are quick, so this is where getting our timing down was crucial. I’m happy to say, both Patricia and I had pretty good timing, so we were able to increase the criteria for Chickira at a steady pace and she was able to achieve the approximations we set forth. We worked on discrimination with Chickira. The first goal was to get her pecking at a target. The first approximation for this was simply to click any interest the chicken showed in the target, which for us, was Chickira bobbing her head towards the target. [youtube id=”7iJOdT5guOk”]We were able to quickly get her pecking the target through a succession of approximations. Next we changed out the large, easy to distinguish black and white target for a smaller, more refined red-dot target. Once she was reliably pecking the red-dot target, we started moving the target around on our work table, so that Chickira had to look for and move to peck the target. After she successfully figured out that game, we added another color: a blue-dot target of same shape and size, only different in color. If she happened to peck on the blue-dot target, she was not punished in any way, she was simply not clicked, thus given no reinforcement. This made it clear to Chickira that if she wanted a click and reinforcement, she needed to peck the red-dot target, and red only. Again, we proofed her by moving the targets around, putting them close to each other, sometimes even overlapping them slightly, but only clicking and reinforcing when Chickira got the correct color. She was a smart chicken though and stepped…err pecked up to the challenge. That’s when we really tested her discrimination skills and added a third color: a yellow-dot. At this level, Chickira faulted a few times, but after some extinction training, she quickly got it. For extinction to work in this exercise, we withdrew the red dot when she incorrectly pecked a different color, only leaving her with the blue and yellow. If she pecked at either of them, she would get nothing. After a few attempts of this, she would give up pecking the “wrong” dots, then we quickly presented her with the red-dot target again. When she pecked it, she got the click and reinforcer, thus strengthening her understanding that red-dot target means good things. For this extinction training to work though, the previous rate of reinforcement had to be fairly high in order for there to be a strong impact. In our case, we were clicking Chickira roughly 11 times within a 30 second frame. By the end, she was actively seeking out the red-dot; and when the red-dot was removed, she would search for it, but not peck the other colors since that was a waste of her energy and yielded her nothing. I throughly enjoyed my two days of working with Terry, Patricia, my friends Pam and Lisa, and all the wonderful people at the workshop. I’m thankful for Narnia Pet Behavior and Training Center for hosting such a wonderful woman and presenter, Terry Ryan. She truly is a gifted person, not only in her “clicking” talent but in her ability to teach others in a learner-based manner. I am all signed up for Chicken Camp 201 this September. 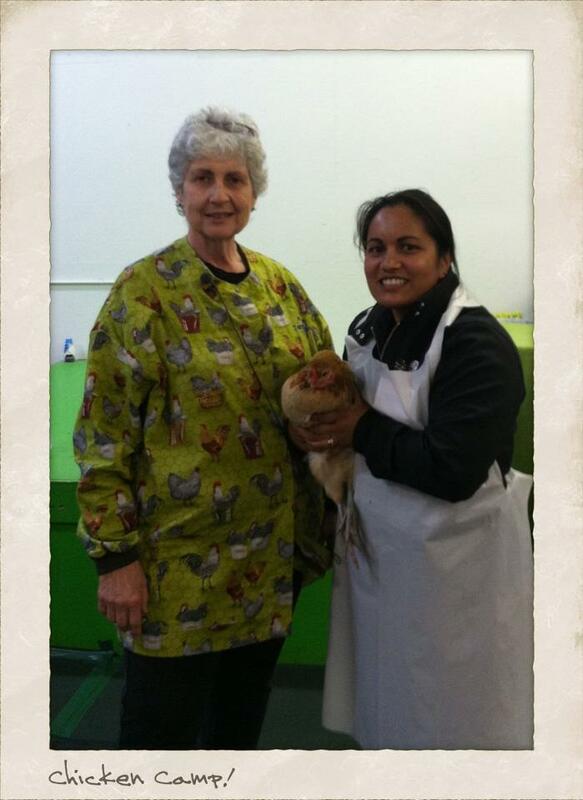 All the chickens who attended Chicken Camp are owned by the same person, Pat, and live a wonderful life on her farm as laying hens. Pat welcomed all of us “Campers” to come out to her farm and work with her chickens whenever we wanted. If only I lived closer to her! Naperville Patch, a local news station covers Chicken Camp (video clip). Take a look at this dog. If this dog came into your local shelter, what breed(s) would she be classified as? I just so happen to know this dog. She was a stray brought into the local humane society two years ago. 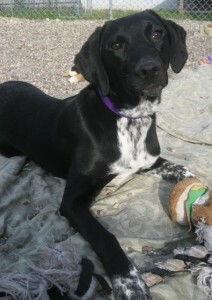 She was labeled as a Labrador Retriever x Springer Spaniel mix. After she was adopted, I did some follow up training sessions with her and her human family members. The family was curious to know her breed(s) so I recommended they DNA test her using the Wisdom Panel test. They decided to do it and recently received the results. It turns out the little Labrador Retriever mix had no Primary markers for Labrador Retriever at all, or Springer Spaniel. Instead, she had markers for Collie and Australian Koolie for one of her parents and her other parent was a true mixed breed with low markers for Australian Shepherd and Standard Poodle. So why does this matter? It matters because everyday mixed breed dogs come into shelters across the country. Many shelters and rescue groups use websites like Petfinder or PetPoint to promote and advertise the dogs they have available, but in order to list a dog on these sites, one must enter a primary breed. There is no true “mixed breed” option. For some dogs this may not matter, but for many other dogs this can mean the difference between life and death. 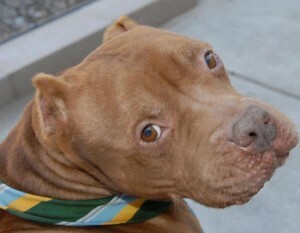 If a dog comes in looking like a pit bull-type dog, that dog may never make it to an adoption floor. Chances are there are many dogs labeled as Pit Bulls that don’t have any primary markers for American Staffordshire Terrier or Staffordshire Bull Terrier in them. Many dog enthusiasts even have a hard time telling breeds apart, so how can we expect the general public to know better? Here’s a great little test for people, Find the Real American Pit Bull Terrier. All the dogs listed on this webpage are purebred dogs, but only one is actually an APBT. In Minnesota for example, Animal Control agencies in the larger cities won’t allow any dog that appears to be a “Bully” breed or Mastiff to be adopted by the public. In fact up until recently they weren’t even allowing these types of dogs to go to rescue groups. Now they are allowing some rescue groups to pull some of the “blocky” looking dogs out, but way too often these dogs aren’t getting pulled in time and end up being euthanized. It doesn’t just affect the “high profile” dogs, others dogs may be looked over because they are or are not labeled as a certain breed. Or if the dog was labeled as certain breed, adopters may place unrealistic expectations on what s/he should act like, for example, a family adopts a dog labeled as a Golden Retriever mix because Goldens have a reputation for being friendly with everyone and good with children. And the only reason the dog was labeled as a Golden was because s/he has long blonde hair and drop ears. Offspring from two purebred dogs can look completely different from their parents. Take for example, the genetic studies done by Drs. John Scott and John Fuller in the 1950’s. These two doctors examined five breeds of purebred dogs and their hybrid offspring. The first generation (F1) of Besenjiis crossed with Cocker Spaniels looked nothing like either of their parents. Look into Genetics and the Social Behavior of the Dog by Scott and Fuller for further reading about their genetic studies and pictures of the F1 and F2 generations of dogs. The only way to truly know if a dog is a purebred dog is if they are registered with a breed group and their lineage is traceable. Or to have a DNA test done and the primary markers come back for that breed. This is not to say there aren’t some dogs with markings unique to their breed that would make them highly likely to be that breed, or at least a mix of it. However, as stated earlier there are many dogs that have a “generic” look to them and could be a mix of a variety of breeds. How many of the medium to large sized black dogs with floppy ears get labeled as Black Labrador Retrievers even though they may not have any Labrador Retriever in them? A lot, I’m guessing! And same goes for the blocky headed dogs with short coats being labeled as Pit Bulls. What are the other options? Move away from labels and just call a dog a dog. Become more Objective with listing the dog’s traits, rather than basing everything on a breed. Describe what the dog actually looks like and facts about the dog: 50 pounds, black and brown, neutered male dog with semi-perk ears, a long tail and medium length coat. Assess the dog’s behavior to find out more about his personality. This will be more helpful for potential adopters anyway. On websites like Petfinder, there could be the option of Small Mixed Breed, Medium Mixed Breed or Large Mixed Breed. It might actually be better to do away with breed classification altogether. Then people would be looking at dogs as individuals rather than a breed. Since, by and large, many people adopting dogs want a nice family pet and not a dog for a specific purpose, such as herding sheep or hunting fowl. After all, dogs are individuals and should be judged by that first, not their breed or looks. This is an Open Letter I sent to the Animal Control Officers and the Community Advisory Board at Minneapolis Animal Care and Control today regarding their policies on bully breed dogs. Last week a dog was posted on the volunteer run facebook page Friends of Minneapolis Animal Care and Control. This dog was tagged for “rescue only” as he is a Pit bull type dog. When I contacted MACC about pulling this dog, I was told only approved rescue groups are allowed to pull dogs. When asked how my rescue group could become approved, I was told that applications were only processed in the fall and to check back then. Meanwhile the dog remained on the web page becoming an increasingly urgent case by each day, since if not rescued he would be euthanized. Last I checked, a group will be coming forward tomorrow to take him, but I found this case upsetting for numerous reasons. I want to express my concerns and frustrations with MACC’s current policy on bully breeds. First off, I see that MACC already adopts out other animals and that there is an application process and contract people must sign. As many of us who have been working with bully breeds for a number of years—and working with big organizations such as BAD RAP out of CA and Animal Farm Foundation out of NY—can tell you, “Thug America” is not coming to shelters to adopt their dogs. 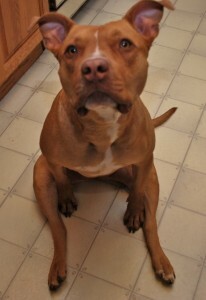 To not even allow bully breed dogs to be put up for adoption by the public is a huge disservice to the dogs. If MACC’s concern really is for the dogs, then make sure all bully breeds are spayed/neutered and micro-chipped prior to adoption and step up the criteria for adopters a bit by making sure they are homeowners or have landlord permission prior to adoption. Another thing that concerns me is the message MACC is sending to the public about these dogs by only allowing them to go to rescue groups. It sends the message that these dogs are somehow damaged or different. It feeds into the misconception that these breeds of dogs are bad or to be feared; something that many of us have been working hard to change. I’m sure you could get some Certified Professional Dog Trainers or people experienced in understanding dog behavior to volunteer their time to evaluate and assess potential available dogs. Please look into people who are Certified through the ASPCA to conduct the SAFER assessment on dogs, or better yet, train your staff to become Certified. I know myself and possibly a few other trainers would be willing to assist in evaluating dogs and training your staff to evaluate future dogs. Lastly, the fact that MACC only reviews applications once per year is very frustrating. There are many rescue groups that could be approved to handle these dogs in need and can’t because of bureaucratic red tape. I understand screening rescue groups to an extent, but when outdated policies get in the way of saving more lives, that’s when there needs to be a change. I’d also like to know the statistics on how many rescue groups have pulled dogs in the past that proved to be bad groups to create this policy in the first place. If MACC isn’t going to change their policy on making Bully breeds available to the public (which would be best), then at least work on changing the policy about reviewing applications. I believe MACC should review applications as they are submitted. I’m sure some volunteers would be happy to work with your organization on checking references and conducting interviews if time management is an issue. Any of us who are in the animal welfare field know very well that funds are tight and resources are strapped, but there is always room for improvement. We are all here to Save More Lives, so why not do more to succeed in that goal! The only way we’ll see changes made in organizations like MACC is to contact them directly and voice our concerns. Please be professional in doing so, as name calling or negativity will not be helpful. If you’d like to see change, please go to MACC’s web page and contact the appropriate people. Do not take this matter up on the FB page, as that is a volunteer run page and the people we want to receive this message do not use it. Go to MACC directly by emailing them. Thank you!